The Friendly Society movement was started in the latter part of the 18th Century, and saw rapid growth in the first half of the 19th Century. This growth was supported by the Government of the day as it tried to reduce the cost of the Poor Law. They saw self help as one way of achieving this. The concept of the societies was that like minded people should come together and make small regular contributions to a central fund on which all were entitled to draw in time of need. Trades unions were banned until the last quarter of the 19th Century, and the Friendly Societies, run for, and by, working class people were vital to many in the struggle to stay out of the dreaded Union Workhouse. The Friendly Societies aims were to provide support, and money, for its members in case of Ill health or who fell on hard times, and also to provide the funds so that an impoverished member would avoid the indignity of a Paupers grave. They also helped widows on the death of a member. The alternative was to rely on the state / Parish which inevitably meant the workhouse. The rules also stated that disabled Servicemen were entitled to receive benefits from the Society, so long as they had paid their dues. Nowadays we talk of those out of work and drawing benefits as being “on the dole”; In those days it was referred to as “being on the box” due to the fact that the Society’s monies were kept in a box, which had three different keys, held by the two Stewards and the Secretary; later, of course the money was deposited in the bank. The Fivehead Friendly Society was established on 11th December 1865. It was called the Fivehead New Eleven Years’ Club, i.e. it was an Eleven year “Breaking” Club, which meant that every 11 years they would stop, ‘break’, and share out the money they had in the Box, or later in the bank. How much each member received would depend upon how long they had been a member and how much they had received in benefits since the previous break. They would also ensure they left sufficient funds in the box / Bank to re-start the Club. The rules were revised in 1887, after 22 years. The entrance fee in 1887 was two shillings and sixpence and the monthly subscription was one shilling. The population of Fivehead in 1901 was 337, and the Society numbered about 100 members. The extract, below, from The Langport and Somerton Herald in 1922 refers to the Fivehead Male Friendly Society. It is believed that there was a Female Society in Fivehead in 1899, but no records survive, although it is believed to have been a seven year breaking club. Friendly Societies were either “Male” or “Female” but never mixed. The local Gentry, the Squire, JP and the Vicar often acted as Trustees of the Society and some were actively involved in the everyday running of their local club. The Officers of the Society were the President, The Hon Secretary and the Treasurer. The Secretary was responsible for the overall running of the club and accounting for the monies received and disbursed. The Treasurer was responsible for investing the monies paid to him from time to time by the Secretary; Deposits were made in Stuckeys Bank in Langport, which became Parrs Bank after a takeover in 1909. The Society was run on a daily basis by two Stewards, appointed for a period of three months and drawn from the rank and file of the members. Their job was to assist in the running and organisation of the club. They made checks upon the sick and oversaw the spending of the clubs money on a members funeral, as well as playing an important part in organising the club feast day. Appointments came round in rotation as per the names on the club roll. This job could be avoided, but usually only by payment of a fine of 1/-. New Stewards were appointed every three months. A General Meeting was held in the Parish School Room every month on a Monday. The highlight of the year was “Club day”, held annually on the last Thursday in May. (See attached Extract from The Langport and Somerton Herald dated 27th May 1922 ). On the Wednesday the Fun Fair arrived. In the 1920s it was Richard Townsend & Sons from Weymouth who brought all their equipment on huge trailers towed by powerful fairground engines. This was set up on Doctors Ground, a field kindly lent for the occasion by Arthur Troutt of Manor Farm. The field is behind the Old Vicarage and adjacent to the Lambert Hut which was convenient for serving teas. The evening before, the President’s chair was prepared in readiness for him to preside over the meal next day. The chair was very high backed and covered with gold chain (Laburnum) and red peonies as well as greenery and flowers. Pictured below is the Presidents Chair in the 1920s. Left: W A K Matterson (? ); Centre: Mr Hutchings; Right: William Gridley, Secretary . The village was also decorated and the brass birds cleaned for the top of the poles which were carried in the procession. Fivehead’s was a dove to represent the one sent by Noah from the Ark and these were handed down from Father to son, although if both were members they would each have had a pole. The women were busy boiling hams and making gooseberry tarts from the first crop of the season and which were eaten with rich cream from local farms. On this particular day remembered in the 1920s, Walter Stodgell. who was deaf and dumb, would be seen, accompanied by several children, raising the flag on the church tower. Soon the bells began to peal and members and their families dressed in their best started to arrive from surrounding villages except for Curry Rivel who had their own group. One family arrived in a large taxi from Over Stratton. The Secretary at that time was Edward Gridley who lived at the Old Vicarage opposite the Church. The President was Francis Mead of Langport who owned a large grocery store there and arrived in a horse drawn carriage. He was followed in later years as president by William Key Matterson of Langford Manor, and William Gridley succeeded his Father as Secretary. At 10 o’clock the procession would form, the men wearing rosettes on their hats and buttonholes of fresh flowers. Each member, who lived within 10 miles of Fivehead, was required to provide for himself his own pole, and they carried the poles over their shoulders with blue ribbons flowing from the top under the brass dove. The Ribbons were 2 yards long and 2 inches wide. (See picture of the Dove below). The Club banner was carried by William Priddle and later by his son. It was royal blue with tassels and an inscription worked on it “Bear one another’s burdens”. It was heavy and constantly mended by Mrs Grace Gridley, Mother of the club secretary, until this was no longer possible and it was taken to Taunton Museum and another banner purchased. The men marched behind the band followed by many women and children usually up Butchers Hill, along the main road and down Ganges Hill, calling at Manor Farm and then on to the church for the 11 o’clock service. As this meant passing the Crown Inn several stewards were appointed to keep order and see that no one took a wrong turning into the Crown – if they did a fine was imposed. The first hymn was always “All people that on earth do dwell” and the sermon contained a mention of the number who had not been seen in church since the previous club day. After church the programme continued with the meal. In the early years a cooked meal had been provided by Alfred Dinham of Tanyard Farm and this was delivered by horse drawn carriage. Cider was a very popular drink and barrels were provided. They would arrive the evening before and were tapped in readiness. Speeches continued until about 3 pm. when they proceeded to Langford Manor where they were entertained by a band. The children all had the day off school and one of their favourite treats were the gingerbreads sold at the fair. Festivities would continue until midnight. The Society became dormant in late 1939, and was wound up after the war with the advent of the Welfare state. The Society’s first Banner was given to the Taunton Museum, after it became too worn to be used, and a second banner was purchased from a top London regalia maker, George Tuthill, of 83, City Road, Pentonville, London, EC1. This, the current banner, was laid up, and hung in St Martin’s Church when the Society folded in 1939, but was taken down some years later as it had deteriorated to the extent that it was literally falling to bits; it was then rolled up and laid under the Altar in the Church, where it remained until 2016. The Club banner, complete with blue tassels has an inscription worked on it “Bear one another’s burdens”. The finial for the pole which carried the banner was made of solid brass and originally, it is thought, had a small ‘olive’ branch in the dove’s beak, to represent the one sent by Noah from the Ark. In addition, every member of the Club had his own pole with a brass finial bearing the Fivehead “Dove (See pictures below). These two brass finials were given to the village by Ron Male, who was a member of the Club in the 1930s. 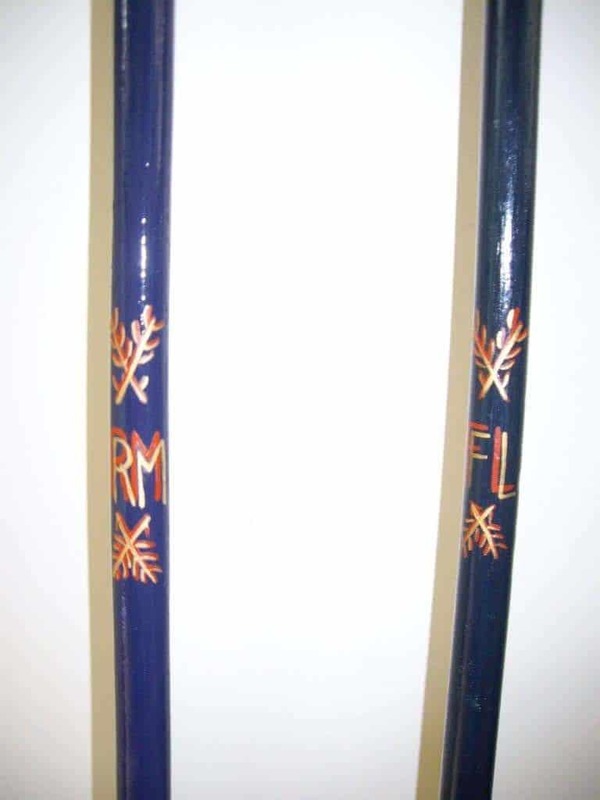 The pole on the right is an original and belonged to Frank Louch, and has his initials on it. 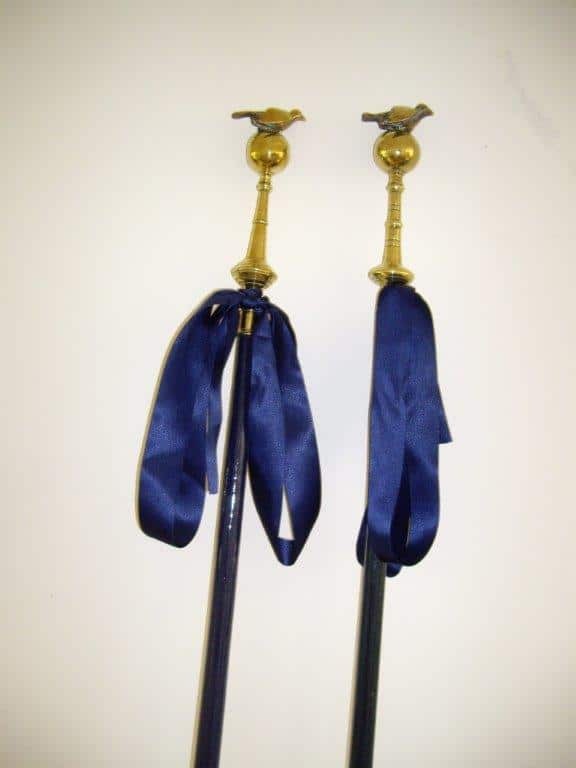 The pole on the left is a replica and bears the initials R M for Ron Male. . On Club day the poles, were carried over the men’s shoulders with blue ribbons flowing from the top under the brass dove. In 2015, advice was sought from the Textile Conservation Centre in Winchester, and we were advised that the banner has both artistic and Textile importance and if possible it should be restored. The cost of restoration at The Textile Conservation Studio in Bristol was £3000 and the restoration was completed in June 2016. It was funded by a Grant of £1,500 from St Andrew’s Conservation Trust, £1,000 from Fivehead Parish Council, of which £500 had been left for the restoration of the Banner, after the Lambert Hut was demolished, and £500 which was donated by Mr Edward Matterson, who now lives in Australia and whose family used to live at Langford Manor (see both articles below); His ancestors were both Officers and Trustees of the Friendly Society. The Banner was then framed and now hangs in the Village Hall. The annual walk and luncheon in connection with the Fivehead Male Friendly Society took place on Thursday. The weather was gloriously fine and the whole proceedings passed off most successfully. Assembling at 10 a.m., the members of the society, headed by their banner and the Curry Rivel Band, marched through the flag-decked streets of the village, making calls at Standerwick House, the residence of Captain C. A. K. Matterson, and the Manor Farm, belonging to Mr. Arthur Troutt. At each residence they were very heartily welcomed. At noon a special service was held at the Parish Church, conducted by the vicar, the Rev. J. Rigbye, the preacher being the vicar of Isle Abbotts, the Rev. W. E. Robinson. During the course of an appropriate address, the preacher alluded to the fact that on that day they were keeping the feast of the Ascension and at the same time keeping the feast of their club. Just after 1 p.m. the members marched to a tent in a field close by, kindly lent by Mr. Arthur Troutt, where an excellent cold luncheon, catered for by Messrs. Hugh Male and E. Gridley, awaited them. Mr. W. A. Key Matterson, the president of the Society, presided, and was supported by the Rev. J. Rigbye, the Rev. W. E. Robinson, Captain P. G. R. Benson, M.F.H., of Bishop’s Lydeard, Captain C. A. Key Matterson, and Messrs. J. E. Calder, Herbert Chedzoy, Hugh Chedzoy, W. Garland, J. Hillard, E. Lock, A. Troutt, W. H. Woodman and the secretary, Mr. E. Gridley. Mr. W. Garland gave the toast of “His Majesty’s Forces,” coupling it with the names of Captain Matterson and Sergeant-Major Calder. Responding, Capt. Matterson thanked them for the very kind way they had received the toast. He spoke on the subject of economy in the departments of His Majesty’s Forces and thought that economy should begin at the right end and they should be very careful where they did economize. (Hear, hear). They should always be ready. (Hear, hear). They had to remember and watch two great countries, Germany and Russia, at the present time; and they should always be prepared. By one stoke of the pen a regiment could be disbanded, but it was much more difficult to reform those regiments. (Hear, hear). Sergt.-Major Calder, whose name was coupled with the toast, said in order to secure peace they must be prepared for war. He mentioned the visit of the King and Queen to the graves of their heroes in Belgium and also the grave of Nurse Cavell and at his suggestion the company then stood in silence in memory of their fallen comrades. The President at this juncture read letters from the following who regretted they were unable to attend:- Dr. Cross, Mr. Barrington, the Rev. Leslie Newton, Mr. H. C. A. Price, Major M. F. Cely Trevilian, Miss Lambert, Mr. Jack Bromfield and Mr. W. W. Goode. In reviewing the finances of the society, the President said last year there was a balance carried over of £158 8s. 4d., the amount taken was £106 18s 6d. and the interest £4 19s. 4d., which gave a total of £270 6s. 2d. The secretary and use of room amounted to £4 6s. 2d. ; doctor, £1 16s 9d. ; two member’s legacies, £12 2s. ; member’s wife £3 1s. 6d. ; debt. on band, £1; this leaving a balance in hand of £247 19s. 9d. Of that balance £237 10s. 4d. lay to the credit of the club in the bank, and £10 9s. 5d. was in the club’s box. In proposing the toast of “The Club,” the President reminded them of what Mr. Calder said to them during his speech. They had recently unveiled and dedicated their war memorial in the parish, which had been erected in memory of their gallant fellows who returned not. Those men belonged to the great friendly society which went to stem the German hordes. (Cheers). In referring to the figure of a dove on their club-pole, the speaker said that the dove was the emblem of peace. When the Armistice was signed there was joy throughout the length and breadth of the land and they all spent a happy time in Fivehead on that day. The “doves” of Fivehead came out over 100 strong. (Laughter). Referring to the friendly society, the President said it was indeed very refreshing to come down and see the friendly society “which bore one another’s burdens.” (Hear, hear). It was sometimes said that country life was very dull, but he did not agree with that. (Cheers). He wished them every luck. After referring to the fact that several members had died during the winter, the President said he wanted to see the society with 200 members. (Cheers). He coupled the toast with the name of their secretary, Mr. E. Gridley. Mr. Gridley, in thanking them for the way they had received the toast, said they had a very good treasurer in Mr. Matterson (CAKM); he was one of the best. (Cheers). Mr. Ed. Hooper called for three cheers for their treasurer and also Mrs. Jessie de Mowbray Matterson, which were heartily given. (Note: After the Club was disbanded, Mr Hooper, annually every club day, 29th May, put his Pole outside his front door). The President next gave the toast of “The Visitors.” He was sure that an ounce of help was worth a pound of pity. (Hear, hear). They very much appreciated their help. He wished to couple the toast with the names of Captain Benson, the popular Master of the Taunton Vale Foxhounds. Captain Benson, who did not only hunt the fox there in the winter, but wished them good luck, when he came to their club. He also coupled the toast with the name of Mr. Ted Louch, who was the worthy son of a worthy father-(hear, hear)- and Messrs. Woodman, J. Hillard, Hugh Chedzoy, and A. Troutt. Captain Benson thanked them for their kindness in coupling his name with the toast, and also for the kind words spoken. When he came to Fivehead hunting with the hounds he enjoyed every moment of the time. When they came hunting to Fivehead nearly always three-quarters of the population were out. (Cheers). They had a splendid sporting spirit in Fivehead. In coming to their club dinner there was always a certain amount of inspiration. Messrs. T. Lock, Woodman, Hillard, Chedzoy and Troutt also responded. After the toast of “The Caterers,” Captain Benson gave the toast of their worthy president. He was an excellent president and comrade and he (the speaker) wished him health, happiness and prosperity. (Loud cheers). Mr. Matterson suitably replied, and said that his mother had been ordered away to the seaside for her health and the first thing she said when she was ordered to go was that she would miss the club. She wished to, say (continued the speaker) that they should come down to Langford and although she was at Seaton she would be at Fivehead in spirit. (Cheers). The company then proceeded to Langford Manor, where Mr. W. A. K. Matterson read a letter from Mrs. Matterson, wishing them good luck. During the evening the usual pleasure fair in the club field attracted a large number of people from the surrounding district and the round-a-bouts, swinging boats, etc., were kept busy until a late hour. Although not in conjunction with the club a sale of work and tea, opened by Miss Lambert, and managed by ladies of the village, took place in the Lambert Hut and attracted a good number of people. The proceeds were in aid of the funds of the Fivehead branch of the British Legion.